These last few days seem to have flown by. While it will be nice to go home after being away so long, I’m going to miss this beautiful country, its people, and especially the time Bob and I have had together here. 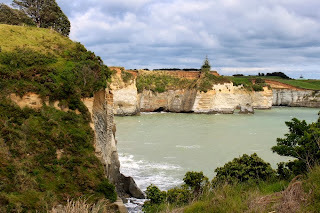 I soak up all that I can while we drive to our first stop this morning, a walk that is called the White Cliffs. We have a little trouble finding the walk but finally see a sign that looks promising. A lady is standing near it and asks us about the White Cliffs walk. She has a book in her hand that explains several walks in the area the shortest being four hours long. She returns to her car to get her gear but not before telling us she has packed food and water. She’s obviously going it alone. Four hours is way too long but we decide that we can at least go part way and turn around. The climb to the top of the hill where the walk starts is steep and graveled. It is really a road leading to a small community but it doesn’t allow public access except by foot. When we see at the top that the track ahead is really just road and open, rather than in a wooded area, we turn around and head back down. We’ve seen the white cliffs, taken a picture, and that’s enough. At the sign next to where we’ve parked, we stop one more time and notice it says that if you are hiking alone you should be sure someone knows your itinerary. The lady walks past us to start up the road and Bob asks her name. Marion, she says. Bob points to the sign and says we just wanted to know in case we hear there’s a Marion missing we can tell someone we saw her. She laughs and starts up the hill—with a lot more gusto than we had. 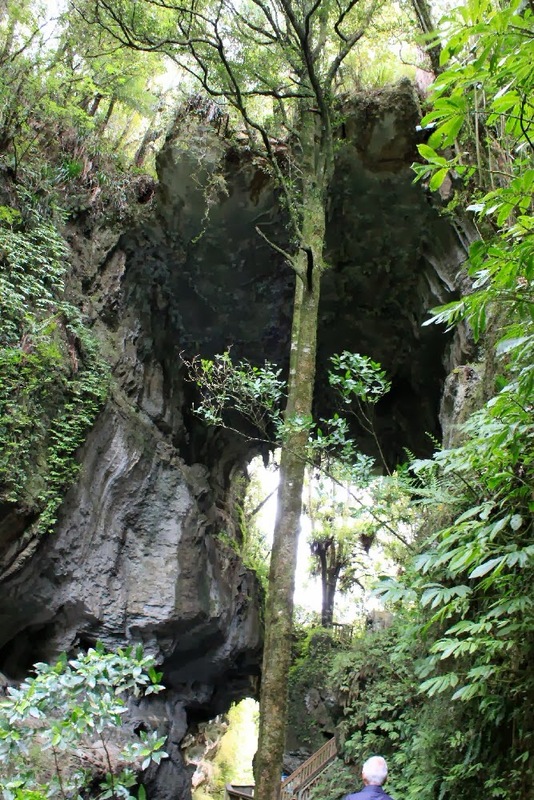 Waitomo is our destination for the day. Originally we planned to take the Waitomo Caves glow worm tour but after having seen them in Paihia at the Kawiti Caves and then again on a nighttime hike in Franz Josef, we decided that we would pass up the tour. The tour is basically a boat ride through a cave where there are hundreds of glow worms in the ceiling. You don’t get very close to them as they are quite a ways above your head. The advantage to the tour however is that you can go any time during the day since it is in a cave and dark so they are glowing. On our arrival in Waitomo, we pass by our B&B and go directly to the track that we plan to hike when it gets dark to see glow worms. There is no charge for this. 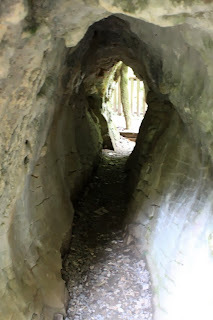 The track also has a huge cave and when we find it we find several glow worms glowing there in the darker recesses. I wonder if we will have to hike to the cave after dark? If so I’m backing out. I’ve already been lightheaded and had to stretch out on one of the resting benches on the way. We must be at a higher altitude and the stress of climbing steps and steep inclines is getting to me. When we reach the bottom of the track where we began, we look more closely at the information on the sign posted there and find that the night time suggestion for glow worms involves an area that is not far up the track and there’s no climbing. Yay! I can do that. We have plenty of afternoon left and decide to try to find the natural bridge walk and the Marokopa waterfall that is on the local map. The road we take is the wrong one and we don’t realize our mistake until we have circled around the area for an hour without seeing any signs for either site. We end up back on the highway south of Waitopo and turn off once again to pass our B&B. Determined, this time we go back and see the correct road and find our way to the Magapohue Natural Bridge. The walk to the bridge is an easy fifteen minutes and we enjoy being outdoors and getting some exercise. 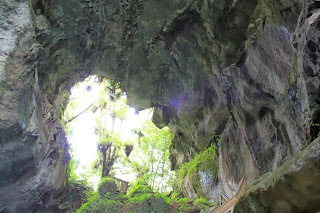 The natural bridge arches above us, formed when the roof of a cave collapsed many years ago. Our guide book says it is especially dazzling at night as there are hundreds of glow worms that light up. Thanks, but no thanks. About to give up on finding the Marakopa Falls, we turn around when Lady Garmon’s map doesn’t look promising and doesn’t match the local map in my hands. We turn around and start back the way we came. As we pass a small parking area we see the problem. A camper van is blocking the sign from the other direction. 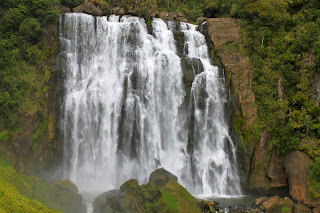 Another fifteen minute walk rewards us with the best waterfall we have seen the whole trip. Nothing like saving the best for last but who knew it would be this good? The waterfall almost looks like a tiered wedding cake. As I take some pictures, I hear Bob strike up a conversation with a lady who is waving to her husband below us. They are from the camper blocking the sign. Bob teases her a bit about it and we learn that they are Australian and come to New Zealand every year for the summer. Kind of like snobirds in reverse. It is time to check into the Waitomo Caves Guest Lodge. It sits on a hill and there’s a climb up a driveway from the guest parking. I’m really glad now that I put everything we need in one suitcase. We do carry up the food cooler since I need to get rid of our leftovers. I give a box of unopened cereal and some cheese to our host and pack the leftover Tim Tams—can’t part with those. There are not a lot of choices for dinner but across the street is a promising place and we try it out. As we think over our five week adventure, we conclude that we really haven’t had a bad meal anywhere. Tonight is no exception. Back in our room, I make coffee one last time in the plunger coffee pot before cleaning it out and packing it carefully in the middle of the suitcase. I think it will make it home all right. (Add coffee plunger to the list of odd souvenirs I’ve collected.) When it is twilight, we grab our flashlight and camera and drive to the entrance to the Ruakuri Cave walk. By the time we get there and walk to where the rock cliffs are, it should be getting pretty dark. On the track, we take the side path that leads over a little bridge. 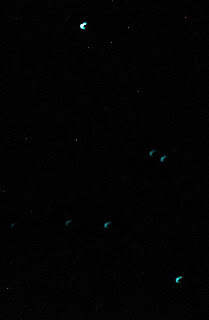 Already we can see some glow worms lighting up in the further recesses. We try desperately to get some photos but it is nearly impossible. Every time I hold the camera to my eye, the display screen blinds me and I can’t see to focus. When I cover the screen with a piece of paper, it’s a little better but I’m still working in the dark. I wish I could get a good picture of their string of sticky beads like we saw at Kawiti but alas, there is just no way. As we turn to go back, a group of young adults is coming at us on the track. A couple of them have those headband flashlights on and they nearly blind us with them. They ask where the glow worms are. With their bright lights they aren’t seeing them. We suggest they tone down the light, let their eyes adjust and look around. 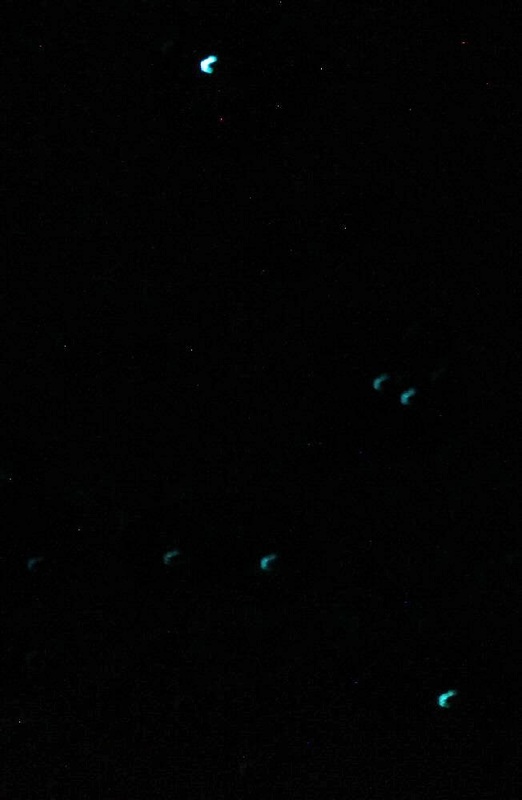 As we walk away, we can hear their surprise as they begin to see the blue dots of light. It’s another rainy night and as we settle into bed, I hope for a brighter day tomorrow. It’s our last day here in New Zealand and I would love for it to be good weather.